A brain tumor is an abnormal growth of tissue in the brain. Unlike other tumors, brain tumors spread by local extension and rarely metastasize (spread) outside the brain. A benign brain tumor is composed of non-cancerous cells and does not metastasize beyond the part of the brain where it originates. A brain tumor is considered malignant if it contains cancer cells, or if it is composed of harmless cells located in an area where it suppresses one or more vital functions. Each year, more than 17,000 brain tumors are diagnosed in the United States. About half of all primary brain tumors are benign, but in life-threatening locations. The rest are malignant and invasive. Benign brain tumors, composed of harmless cells, have clearly defined borders, can usually be completely removed, and are unlikely to recur. Benign brain tumors do not infiltrate nearby tissues but can cause severe pain, permanent brain damage, and death. Benign brain tumors sometimes become malignant. Malignant brain tumors do not have distinct borders. They tend to grow rapidly, increasing pressure within the brain (IICP) and can spread in the brain or spinal cord beyond the point where they originate. It is highly unusual for malignant brain tumors to spread beyond the central nervous system (CNS). Primary brain tumors originate in the brain. They represent about 1% of all cancers and 2.5% of all cancer deaths. Central nervous system (CNS) — The division of the nervous system that consists of the brain and spinal cord. Cerebrospinal fluid (CSF) — Clear liquid that fills brain cavities and protects the brain and spinal cord. Gamma knife — High-dose radiation treatment for intracranial tumors. Intracranial — Located within or on the surface of the brain. A scan of a brain with a tumor located in the central right portion of the brain. melanoma (cancer) of the skin. These metastatic brain tumors can develop on any part of the brain or spinal cord. cancer within the nasal passages and/or throat that follow the nerve pathways into the skull, and metastasize to the brain. Brain tumors can develop at any age, but are most common in children between the ages of 3-12, and in adults aged 55-65. Primary brain cancer is the second most common cause of cancer death between birth and the age of 34, and the fourth most common cause of cancer death in men aged 35-54. Primary tumors of the brain and central nervous system are often associated with HIV infection. Men and caucasians have a higher risk of developing brain tumors. Other risk factors being studied include children with a history of previous radiation treatment to the head for cancer; parents with certain cancers (nervous system, salivary gland, colon); having an older father; having well-educated parents; occupational exposure to vinyl chloride, lead, and pesticides; history of epilepsy; history of certain genetic conditions (tuberous sclerosis, neurofibromatosis, von Hippel Lindau, familial polyposis, Osler-Weber-Rendu, Li-Fraumeni). Low-grade brain tumors usually have well-defined borders. Some low-grade brain tumors form or are enclosed (encapsulated) in cysts. Low-grade brain tumors grow slowly, if at all. They may spread throughout the brain, but rarely metastasize to other parts of the body. Mid-grade and high-grade tumors grow more rapidly than low-grade tumors. Described as "truly malignant," these tumors usually infiltrate healthy tissue. The growth pattern makes it difficult to remove the entire tumor, and these tumors recur more often than low-grade tumors. A single brain tumor can contain several different types of cells. The tumor's grade is determined by the highest-grade (most malignant) cell detected under a microscope, even if most of the cells in the tumor are less malignant. An infiltrating tumor is a tumor of any grade that grows into surrounding tissue. Glioma is the term used to refer to the most prevalent primary brain tumors. Gliomas arise from glial tissue, which supports and nourishes cells that send messages from the brain to other parts of the body. These tumors may be either malignant or benign. Astrocytomas, ependymomas, and mixed gliomas are three of the most common gliomas. ASTROCYTOMAS. Named for the star-like shape of their cells, astrocytomas can develop on any part of the brain or spinal cord. Non-infiltrating astrocytomas grow slowly, and rarely spread to nearby tissue. Mild-to-moderately anaplastic astrocytomas with well-differentiated borders do not grow as slowly as non-infiltrating astrocytomas, and they do spread to surrounding tissues. Anaplastic astrocytomas, which are also called Grade III astrocytomas, look more abnormal and grow more rapidly than non-infiltrating or mild-to-moderately anaplastic tumors. Grade IV astrocytomas are also called glioblastoma multiforme (GBM) tumors. Accounting for 30% of all primary brain tumors, GBMs are the most common brain tumors in middle-aged adults. GBMs are the most malignant of all brain tumors. Because they contain a greater mixture of cells than any other brain tumor, they are the most difficult to treat. EPENDYMOMAS. Also called ependymal tumors, ependymomas account for 9% of all gliomas, and 5% of all intracranial tumors. These tumors, which are most common in children and adolescents, begin in the very thin membranes that help form cerebrospinal fluid (CSF) and line the brain cavities (ventricles) that contain it. Ependymomas are usually benign, have well-differentiated borders, resemble normal cells, and grow very slowly. The cells of anaplastic (malignant) ependymomas look abnormal and grow more rapidly than the cells of benign tumors. MIXED GLIOMAS. These heterogeneous tumors contain elements of astrocytomas and ependymomas and/or oligodendrogliomas. These are rare tumors that usually occur in middle-aged adults, grow slowly, and do not usually spread beyond the part of the brain where they originate. Mixed gliomas behave like tumors composed of the highest-grade cells they contain. The most common brain tumors that do not develop from glial cells are medulloblastomas, meningiomas, and Schwannomas. MEDULLOBLASTOMAS. Scientists once thought medulloblastomas (MDLs) developed from glial cells. These fast-growing, malignant tumors are now believed to originate in developing cells not normally present in the body after birth. They are sometimes called primitive neurodectal tumors (PNET). MDL tumors are most common in children and are more common in boys than in girls. Only 30% of MDL tumors occur in adults. MDL tumors usually originate in the cerebellum (the part of the brain that controls coordination and some muscle activity), and are often carried to other parts of the brain by cerebrospinal fluid. MDL tumors rarely metastasize beyond the brain and spinal cord. MENINGIOMAS. Meningiomas, which represent more than 20% of all primary brain tumors, originate in the membranes that enclose the brain and spinal cord (meninges). These tumors are usually benign and most often occur in women aged 30-50 years old. Meningiomas grow so slowly that the brain can sometimes become accustomed to their presence. Meningiomas compress, rather than invade, brain tissue and may grow to be quite large before any symptoms appear. SCHWANNOMAS. Schwannomas originate in the Schwann cells. These cells produce myelin, material that protects the acoustic nerve, which controls hearing. These benign tumors are twice as common in women as in men, and are most often diagnosed in patients between the ages 30-60. Schwannomas grow very slowly, and many people adapt to the slight hearing loss and balance problems that are the tumors' earliest symptoms. A pear-shaped Schwannoma can cause sudden or gradual loss of hearing in an ear. As the tumor progresses, it can press on the nerves that control movement and feeling in the face, and cause headaches and facial numbness or tingling. The patient may have trouble walking, swallowing, or controlling eye movements, and the sense of taste can be affected. A Schwannoma that grows large enough to press on the brainstem can be deadly. CHILDHOOD BRAIN TUMORS. Brain tumors that occur in children are described as supratentorial (in the upper part of the brain) or infratentorial (in the lowest part of the brain). Astrocytomas and ependymomas are common supratentorial tumors. Infratentorial tumors include medulloblastomas, astrocytomas, and ependymomas. The cause of primary brain tumors is unknown, but people who work with rubber and certain chemicals have a greater-than-average risk of developing them. There is no evidence that head injury causes brain tumors, but researchers are trying to determine the relationship, if any, between brain tumors and viruses, family history, and long-term exposure to electromagnetic fields. A doctor should be notified whenever a patient experiences one or more of the symptoms. a lumbar puncture (spinal tap) to obtain spinal fluid, which may contain tumor cells. Interpreting these images and results of laboratory analysis allows neurologists to determine whether a tumor is present, but microscopic examination of tumor tissue (biopsy) is the only way to identify the kind of cells it contains. Patients whose benign brain tumors can be completely removed may not require any additional treatment, but periodic physical and neurologic examinations and CT or MRI scans are sometimes recommended to determine whether the tumor has returned. Because surgeons cannot be sure that every bit of an infiltrating or metastasizing tumor has been removed, radiation and chemotherapy are used to eradicate cells that may have escaped the scalpel. If a tumor cannot be completely removed, removing a portion of it (debulking) can alleviate the patient's symptoms, enhance the sense of well-being, and increase the effectiveness of other treatments. External radiotherapy, generally delivered on an outpatient basis, directs radiation to the tumor and the area around it. Implant radiation therapy involves placing tiny pieces of radioactive material in the brain. Left in place permanently, or for a short time, these radioactive pellets release measured doses of radiation each day. This technique is called brachytherapy. Patients are usually hospitalized during the several days the pellets are most active. Stereoactic radiosurgery involves fitting the patient with a frame to stabilize the head, using imaging techniques to determine the exact location of tumor cells, and using a sophisticated instrument to administer radiation precisely to that point. Instruments used for delivery of radiation include the gamma knife, adapted linear accelerator (LINAC), and cyclotron. A variety of drugs may also be given during radiation therapy, to protect brain cells from the effects of radiation (radioprotective drugs), to increase the sensitivity of tumor cells to radiation (radiosensitizers), or to boost radiation's effects (radioenhancers). One or more cancer-killing drugs may be taken by mouth or injected into a blood vessel, muscle, or the cerebrospinal fluid. Chemotherapy may be used with radiation and surgery as part of a patient's initial treatment, or used alone to treat tumors that recur in the same place or in another part of the body. The usual chemotherapy regimen for a brain tumor is a combination approach, most commonly using procarbazine, CCNU, and vincristine. interstitial chemotherapy is performed at the time of surgery. A chemotherapy-soaked wafer is placed in the cavity left after tumor removal. Intrathecal chemotherapy instills the medications right into the spinal fluid. Intraarterial chemotherapy uses tiny catheter tubes to delivery high-dose chemotherapy directly into the arteries of the brain. Potentially toxic chemotherapy drugs can be wrapped in special biologic envelopes called liposomes, to allow the drugs to be delivered to the tumor without adversely affecting other healthy tissues along the way. Electrochemotherapy uses electric voltage to transport chemotherapy agents into the brain. When a young child has a brain tumor, chemotherapy is often used to eliminate or delay the need for radiation. Monoclonal antibodies, which pair antibodies with radioactive substances. The antibodies are directed to find and attach to tumor cells, at which time the radioactive substance kills the tumor cell. Interleukin and interferon, which are substances produced naturally by the human immune system which seem to kill tumor cells. Scientists seek to produce these substances in the laboratory and incorporate their use in brain tumor treatment. T-lymphocytes, which are also produced normally by the human immune system, and are being used to inject directly into the tumor location during surgery and to infuse into the bloodstream after surgery, in the hopes that they will boost the immune system's ability to fight tumor cells. Tumor vaccines, which use elements of tumor cells to stimulate the patient's immune system. Methods of incorporating chemotherapy drugs into tumor cells to reduce the need for radiation. Laboratory techniques that enable physicians to select the chemotherapy drugs most likely to kill particular types of tumors. Gene therapy in which genetically engineered material is transported to tumor cells by viruses that infect tumor cells and convert them to normal cells, stop their growth, or kill them. Alternative treatments have not been shown to cure brain tumors and should never be substituted for conventional therapy. However, complementary therapies (used with, not instead of, standard treatments) can help some patients cope with the stress of their illness and side effects of their treatment. Massage, meditation, and reflexology help some patients relax; while yoga is said to soothe the body, spirit, and mind. Hydrotherapy uses ice, liquid, and steam to improve circulation and relieve pain. Therapeutic touch practitioners say they can relieve pain and other symptoms by moving their hands in slow, rhythmic motions several inches above the patient's body. Botanical therapies, homeopathic treatment, traditional Chinese medicine treatments, nutritional focuses on diet and supplements, and detoxification can also be incorporated as complementary therapies. Although these post-operative problems may initially be more severe than the symptoms produced by the tumor, they will probably diminish or disappear in time. Occupational therapy can teach patients and their families new ways to approach daily tasks. Physical therapy can benefit patients who have difficulty keeping their balance, expressing their thoughts, speaking, or swallowing. Children may need special tutors before and after returning to school. For patients who have incurable brain tumors, hospice care may be available. Hospices provide a supportive environment and help patients manage pain and remain comfortable. Cells killed by radiation can cluster in the brain, resembling tumors. They can cause headaches, seizures, and memory loss. Children treated with radiation may lose some of their eyesight and develop learning problems. Radiation damage to the pituitary gland can hinder normal growth and development. Some drugs used to treat brain tumors can cause kidney damage and temporary or permanent tingling in the fingers and ringing in the ears. Brain tumors that cannot be removed may cause irreversible brain damage and death. The cause of primary brain tumors has not been determined, so there is no known way to prevent them. excessive exposure to the sun, which can cause melanoma (a deadly form of skin cancer). Monthly self-examinations of the breasts and testicles can detect breast and testicular cancer at their earliest, most curable stages. American Brain Tumor Association. 2770 River Road, Des Plaines, IL 60018. (847) 827-9918, (800) 886-2289. 〈http:/www.abta.org〉. Brain Tumor Foundation for Children, Inc. 2231 Perimeter Park Drive, Suite 9, Atlanta, GA 30341. (404) 454-5554. Brain Tumor Information Services. Box 405, Room J341, University of Chicago Hospitals, 5841 S. Maryland Avenue, Chicago, IL 60637. (312) 684-1400. MedHelp International. 6300 N. Wickham, Suite 130, Box 188, Melbourne, FL 32940. (407) 253-9048. 〈http://www.medhlp.netusa.net〉. National Brain Tumor Foundation. 785 Market Street, #1600, San Francisco, CA 94103. 〈http://www.oncolink.penn.edu/psychosocial〉. Adult Brain Tumor. May 2001. 〈http://cancernet.nci.nih.gov/clinpdq/pif/Adult_brain_tumor_Patient.html〉. Brain Tumor, Primary. Nidus Information Services, Well Connected, 2001. "Brain Tumors," Abeloff: Clinical Oncology, 2nd ed. Churchill Livingstone, Inc., 2000. "Brain Tumors," Goldman: Cecil Textbook of Medicine. 21st ed. W. B. Saunders Company, 2000. Childhood Brain Tumor. May 2001. http://cancernet.nci.nih.gov/clinpdq/pif/Childhood_brain_tumor_Patient.html. Question: What is a Gamma Knife? April 13, 2001. 〈http://oncolink.upenn.edu/specialty/med_phys/gamma.html〉. The brain is made up of billions of nerve cells, intricately connected with each other. It contains nerve centers (groups of neurons and their connections) which control many involuntary functions, such as circulation, temperature regulation, and respiration, and interpret sensory impressions received from the eyes, ears, and other sense organs. Consciousness, emotion, thought, and reasoning are functions of the brain. It also contains centers or areas for associative memory which allow for recording, recalling, and making use of past experiences. Cerebrum. The largest and main portion of the brain, the cerebrum is made up of an outer coating, or cerebral cortex, consisting of gray matter, several cell layers deep, covering the cerebral hemispheres. The cortex is the thinking and reasoning brain, the intellect, as well as the part of the brain that receives information from the senses and directs the conscious movements of the body. In appearance the cortex is rather like a relief map, with one very deep valley (longitudinal fissure) dividing it lengthwise into symmetrical halves, and each of the halves again divided by two major valleys and many shallower folds. The longitudinal fissure runs from the brow to the back of the head, and deep within it is a bed of matted white fibers, the corpus callosum, which connects the left and right cerebral hemispheres. The major folds of the cortex divide each hemisphere into four sections or lobes: the occipital lobe at the back of the skull, the parietal lobe at the side, the frontal lobe at the forehead, and the temporal lobe at the temple. The Senses. The major senses of vision and hearing have been well mapped in the cortex; the center for vision is at the back, in the occipital lobe, and the center for hearing is at the side, in the temporal lobe. Two other areas have been carefully explored, the sensory and motor areas for the body, which parallel each other along the fissure of Rolando. In the sensory strip are the brain cells that register all sensations, and in the motor strip are the nerves that control the voluntary muscles. In both, the parts of the body are represented in an orderly way. It is in the sensory areas of the brain that all perception takes place. Here sweet and sour, hot and cold, and the form of an object held in the hand are recognized. Here are sorted out the sizes, colors, depth, and space relationships of what the eye sees, and the timbre, pitch, intensity, and harmony of what the ear hears. The significance of these perceptions is interpreted in the cortex and other parts of the brain. A face is not merely seen; it is recognized as familiar or interesting or attractive. Remembering takes place at the same time as perception, so that other faces seen in the past, or experiences linked to that face are called up. Emotions may also be stirred. For this type of association the cortex draws on other parts of the brain by way of the communicating network of nerves. Memory. In the temporal lobe, near the auditory area, is a center for memory. This center appears to be a storehouse where memories are filed. When this area alone is stimulated, a particular event, a piece of music, or an experience long forgotten or deeply buried is brought to the individual's mind, complete in every detail. This is a very mechanical type of memory; when the stimulation is removed the memory ends. When it is applied again, the memory begins again, not where it left off, but from the beginning. Brainstem. This is the stemlike portion of the brain connecting the cerebral hemispheres with the spinal cord, and comprising midbrain, pons, and medulla oblongata. Some consider it to include the diencephalon. Thalamus. This organ lies beneath the cortex, deep within the cerebral hemispheres. It is a relay station for body sensations, and integrates these sensations on their way to the cortex. The thalamus is an organ of crude consciousness and of sensations of rough contact and extreme temperatures, either hot or cold. It is principally here that pain is felt. In the thalamus, responses are of the all-or-nothing sort; even mild stimuli would be felt as acutely painful if they were not graded and modified by the cortex. Hypothalamus. This organ lies below the thalamus, at the base of the cerebrum. It is small (no larger than a lump of sugar), but takes part in such vital activities as the ebb and flow of the body's fluids and the regulation of metabolism, blood sugar levels, and body temperature. It directs the body's many rhythms, including those of activity and rest, appetite and digestion, sexual desire, and menstrual and reproductive cycles. The hypothalamus is also the body's emotional brain. It is the integrating center of the autonomic nervous system, with its sympathetic and parasympathetic branches, and is located close to the pituitary gland. Midbrain. Just below the thalamus is the short narrow pillar of the midbrain. This contains a center for visual reflexes, such as moving the head and eyes, as well as a sound-activated center, obsolete in humans, for pricking up the ears. Medulla Oblongata. Below the midbrain is the medulla oblongata, the continuation upward of the spinal cord. In the medulla, the great trunk nerves, both motor and sensory, cross over, left to right and right to left, producing the puzzling phenomenon by which the left cerebral hemisphere controls the right half of the body, while the right hemisphere controls the left half of the body. This portion of the brain also contains the centers that activate the heart, blood vessels, and respiratory system. Cerebellum. The cerebellum (Latin for “little brain”) is attached to the back of the brainstem, under the curve of the cerebrum. It is connected, by way of the midbrain, with the motor area of the cortex and with the spinal cord, as well as with the semicircular canals, the organs of balance. The function of the cerebellum is apparently to blend and coordinate motion of the various muscles involved in voluntary movements. It does not direct these movements; that is the function of the cortex. The cortex, however, operates in terms of movements, not of muscles. 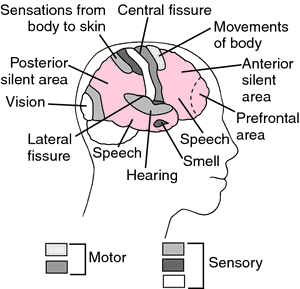 As a conscious function the cortex may, for example, direct the arm to pick up a glass of water; the cerebellum, which operates entirely below the level of consciousness, then translates this instruction into detailed actions by the 32 different muscles in the hand, plus several more in the arm and shoulder. When the cerebellum is injured, the patient's movements are jerky and uncoordinated. Cranial Nerves. These are twelve nerves that arise within the skull. All but the olfactory nerve emerge from the brainstem. Most, with the important exception of the vagus nerve, serve the head and neck. See also cranial nerves. Protection of the Brain. The brain is protected by the bony skull and by three layers of membranes, the meninges. Between the middle and inner layer is a space filled with cerebrospinal fluid, which serves as a shock absorber. The same system of membranes and fluid protects the spinal cord. The brain is protected from harmful substances in the bloodstream by a barrier called the blood-brain barrier, which keeps some of the substances out of the brain entirely and delays the entry of others for hours or even days after they have penetrated the rest of the body. Projection areas of the brain. brain abscess a localized suppurative lesion within the intracranial cavity; most cases are secondary to middle ear infections. Other causes include compound fracture of the skull with contamination of brain tissue, sinusitis, and infections of the face, lung or heart. Symptoms include fever, malaise, irritability, severe headache, convulsions, vomiting, and other signs of intracranial hypertension. Treatment consists of surgical removal of the infected area and administration of antibiotics. brain death the irreversible cessation of all brain activity for an appropriate observation period, at least 24 hours, so that cardiopulmonary functions must be artificially maintained. A presidential commission in the USA accepted criteria for such a diagnosis, including cessation of all brain functions, including cerebral functions and brainstem (reflex) functions; irreversibility of the cessation; establishment of the cause of coma, sufficient to explain the loss of brain function; exclusion of possibility of recovery of brain function; and persistence of the cessation for an appropriate period of observation or trial of therapy. Complicating conditions must also be excluded. Called also irreversible coma. brain scanning a nuclear medicine procedure for the detection of brain tumors, areas of stroke syndrome, abscesses, hematomas, and other intracranial lesions. A radiopharmaceutical, such as 99mTc-pertechnetate, is injected intravenously and is carried to the brain, where it localizes around any lesion that alters the blood-brain barrier. A scintillation camera makes an image of the distribution of radioactivity in which a lesion appears as a region of increased activity. Computed tomography brain scanning is an alternative procedure, which is more effective than radionuclide scans for the detection of some lesions. brain tumor a neoplasm of the intracranial portion of the central nervous system. Any abnormal growth within the skull creates a special problem because it is in a confined space and will press on normal brain tissue and interfere with the functions of the body controlled by the affected parts. This is true whether the tumor itself is benign or malignant. Fortunately, the functions of certain areas of the brain are well known, and a disturbance of some specific function guides the clinician to the affected area. If diagnosed early, a benign tumor often can be removed surgically with a good chance of recovery. Malignant tumors are more difficult to remove. The causes of brain tumors are not known. They are not common, but they can occur at any age and in any part of the brain. Some originate in the brain itself, while others metastasize from a tumor in another part of the body. The symptoms of brain tumor vary and depend on the location and size of the tumor. Headache together with nausea is sometimes the first sign. The headache can be generalized or localized in one part of the head, and the pain is usually intense. Vomiting can be significant if it is sudden and without nausea. Disturbances of vision, loss of coordination in movement, weakness, and stiffness on one side of the body are also possible symptoms. Loss of sight, hearing, taste, or smell may result from brain tumor. A tumor can also cause a distortion of any of these senses, such as seeing flashes at the sides of the field of vision, or smelling odors or hearing sounds that do not exist. It can affect the ability to speak clearly or to understand the speech of others. Varying degrees of weakness or paralysis in the arms or legs may appear. A tumor may cause convulsions. Changes in personality or mental ability are rare in cases of brain tumor. When such changes occur they may take the form of lapses of memory or absentmindedness, mental sluggishness, or loss of initiative. an invasive neoplasm of the intracranial portion of the central nervous system. Brain tumors cause significant rates of morbidity and mortality but are occasionally treated successfully. In adults 20% to 40% of malignancies in the brain are metastatic lesions from cancers in the breast, lung, GI tract, or kidney or a malignant melanoma. These are referred to as secondary tumors. The origin of primary brain tumors is not known, but the risk is increased in individuals exposed to vinyl chloride, in the siblings of cancer patients, and in recipients of renal transplantation being treated with immunosuppressant medication. Causes under investigation are genetic changes, heredity, ionizing radiation, environmental hazards, viruses, and injury. Symptoms of a brain tumor are often those of increased intracranial pressure, such as headache, nausea, vomiting, papilledema, lethargy, and disorientation, but vary depending on the site of a tumor. Localizing signs, such as loss of vision on the side of an occipital neoplasm, may occur. Diagnostic measures include visual field and funduscopic examinations, skull x-ray examinations, electroencephalography, brain scanning, magnetic resonance imaging, computed tomography, and spinal fluid studies. Cerebral angiography is used for information about vascular supply. 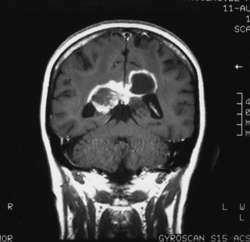 Gliomas, chiefly astrocytomas, are the most common malignancies. Medulloblastomas occur often in children. Surgery is the initial treatment for most primary tumors of the brain. Radiotherapy is indicated for inoperable lesions, medulloblastomas, and tumors with multiple foci and is used in postoperative treatment of residual tumor tissue. The blood-brain barrier impedes the effect of some antineoplastic agents, but the administration of disk-shaped drug wafers is an emerging practice. Postoperative nursing care includes assessment of the patient to detect elevation in intracranial pressure. Compare spinal cord tumor. Neurology A neoplasm affecting the brain which may be 1º–brain or meninges, or 2º–ie metastatic to the brain; malignant gliomas account for 2.5% of all cancer-related deaths; BTs are the 3rd most common CA in ages 15-34; 35,000 BTs occur/yr–US; 1st-degree relatives of children with brain tumors have a 5-fold ↑ in the risk of CNS tumors, leukemia, and other childhood tumors in the affected family Clinical Seizures, vision or hearing loss, hemiparesis, double vision, headache, weird behavior, N&V, memory loss Imaging MRI without and with contrast, CT Management Surgery, gamma knife radiotherapy are often effective; chemotherapy, immunotherapy are not. See Gamma knife. Cerebral neoplasm that can be either benign or malignant; often produced by metastasis. 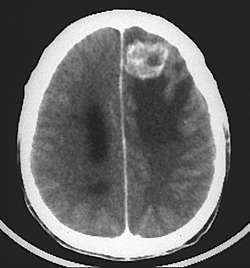 An inexact term to describe any intracranial mass: neoplastic, cystic, inflammatory (abscess), or syphilitic. Neoplastic brain tumors may be benign or malignant. Malignant brain lesions may be primary or secondary, resulting from metastatic spread of other cancers. Primary malignant brain tumors make up from 10% to 30% of adult cancers and about 20% in children, but any of these tumors may occur at any age. Incidence in children is usually greatest before age 12, with astrocytomas, medulloblastomas, ependymomas, and brain stem gliomas being most common. In adults the most common tumors are gliomas and meningiomas, usually occurring supratentorially. Other malignant tumor types are oligodendrogliomas and acoustic neuromas (Schwannomas). Most malignant brain tumors are metastatic, with 20% to 40% of patients with cancer developing brain metastasis. The cause of primary brain cancers is unknown; however, one known environmental risk is exposure to ionizing radiation. Cell phone use has been implicated in acoustic neuromas. Central nervous system changes occur as the lesions invade and destroy tissue, and, because the tumors compress the brain, cranial nerves, and cerebral blood vessels, the compression causes cerebral edema and increased intracranial pressure (ICP). Most clinical signs are due to the increased ICP, but signs and symptoms may vary due to the type of tumor, its location, and the degree and speed of invasion. Usually the onset of symptoms is insidious, with brain tumors frequently misdiagnosed. The patient is evaluated for neurological deficits (headache, mental activity changes, behavioral changes, weakness, sensory losses, or disturbances of vision, speech, gait, or balance). The patient is monitored for seizures and increased ICP. Diagnostic tools include skull x-rays, brain scan, CT scan, MRI, cerebral angiography, and EEG. Lumbar puncture demonstrates increased pressure and protein levels, decreased glucose levels, and (sometimes) tumor cells in the cerebrospinal fluid (CSF). Definitive diagnosis is by tissue biopsy performed by stereotactic surgery. Treatment includes excision if the tumor is resectable, and size reduction if he tumor is not respectable; relieving cerebral edema, reducing ICP, and managing other symptoms; and preventing further neurologic damage. Treatment is determined by the tumor’s histology, radiosensitivity, and location. Functional MRI can map the brain function surrounding a tumor to help design a surgical approach that removes the tumor while avoiding damage to areas critical for normal functioning. Surgery, radiation, chemotherapy, and/or decompression for increased ICP with diuretics, corticosteroids, or sometimes ventroatrial or ventroperitoneal CSF shunting. Focused and computerized robotic radiation methods such as the Gamma Knife and Cyberknife permit delivery of more radiation to the tumor and less to surrounding normal tissue. Radiation therapy can cause inflammation; therefore the patient is monitored for increasing ICP. If radiation is to be used after surgery, it will be delayed until the surgical wound has healed. However, even after local healing occurs, radiation can break down the wound; therefore the area of the incision must be assessed for infection and sinus formation. Chemotherapy for malignant brain tumors includes use of nitrosureas (BCNU, CCNU, procarbazine) to help break down the blood-brain barrier allowing entrance of other chemotherapy agents. Antiemetics are provided before and after chemotherapy to minimize nausea and prevent vomiting. The patient is assessed over the following weeks for bone marrow suppression, is advised to report signs of infection or bleeding, and is to avoid contact with crowds and people with respiratory infections. The oral agent temozolomide (Temodar) crosses the blood-brain barrier and is usually well tolerated by the patient. Intrathecal or intra-arterial administration helps increase drug action. Convection-enhanced delivery systems infuse the antitumor agent directly into the brain, bypassing the blood-brain barrier, to pump drugs slowly through 2 to 4 implanted catheters to where a tumor was removed, to attach to and kill remaining tumor cells, and to shrink a tumor before surgery. A disc-shaped drug wafer can be implanted during surgery to deliver chemotherapy directly to the tumor. MRI spectroscopy reveals the physiology of treated tumors to differentiate dead tissue from an actively growing tumor. The patient must be monitored closely for changes in neurologic status and increases in ICP. A patent airway must be maintained and respiratory changes monitored. The patient's safety must be ensured. Temperature must be monitored closely. Steroids and osmotic diuretics are administered as prescribed. Fluid intake may be restricted to 1500 ml/24 hr. Fluid and electrolyte balance is monitored to prevent dehydration. Stress ulcers may occur; therefore the patient is assessed for abdominal distention, pain, vomiting, and tarry stools. Stools are tested for occult blood. Antacids and anti-histamine-2 agents are administered as prescribed. For postcraniotomy surgery, all general patient care concerns apply. General neurologic status and ICP remain the assessment priorities. Positioning of the patient after surgery depends on the procedure: after supratentorial craniotomy, the head of the bed should be elevated 30° and the patient positioned on the side to promote venous drainage, reduce cerebral edema, allow drainage of secretions and prevent aspiration. After infratentorial craniotomy, the patient should be kept flat for 48 hr but log-rolled side to side every 2 hr to minimize complications from immobility. Because brain tumors and their treatment frequently result in residual disabling neurologic deficits, a rehabilitation program should be started early. Physical and occupational therapists help the patient maintain independence and quality of life and provide aids for self-care and mobility. If the patient is aphasic or develops dysphagia, a speech pathologist must be consulted. Depression is common, and psychological consultation for behavioral or drug therapies may be helpful. Emotional support is provided to the patient and family for treatments, disabilities, changes in lifestyle, and end-of-life issues. The patient and family are referred to resource and support services (e.g., social service, home health care agencies, the American Cancer Society, and other such voluntary agencies). Q. What is a brain tumor? A. A brain tumour is any intracranial tumor normally either in the brain itself in the cranial nerves, in the brain envelopes, skull, pituitary and pineal gland, or spread from cancers primarily located in other organs (metastatic tumors). It is created by abnormal and uncontrolled cell division. Primary (true) brain tumors (which start in the brain) are commonly located in the posterior cranial fossa in children and in the anterior two-thirds of the cerebral hemispheres in adults, although they can affect any part of the brain. Q. How can you know if you have a brain tumor or not? Does it have symptoms? Same is stroke? Painful? And is it curable? I’ll appreciate honesty. Thanks! A. Headaches, epileptic seizures, vomiting + nausea, depend on the tumor location- problem with neurological functions. If it’s curable? Well that depends…what kind of tumor is it? Where is it located? How soon was it diagnosed? The best way to diagnose it is by MRI.